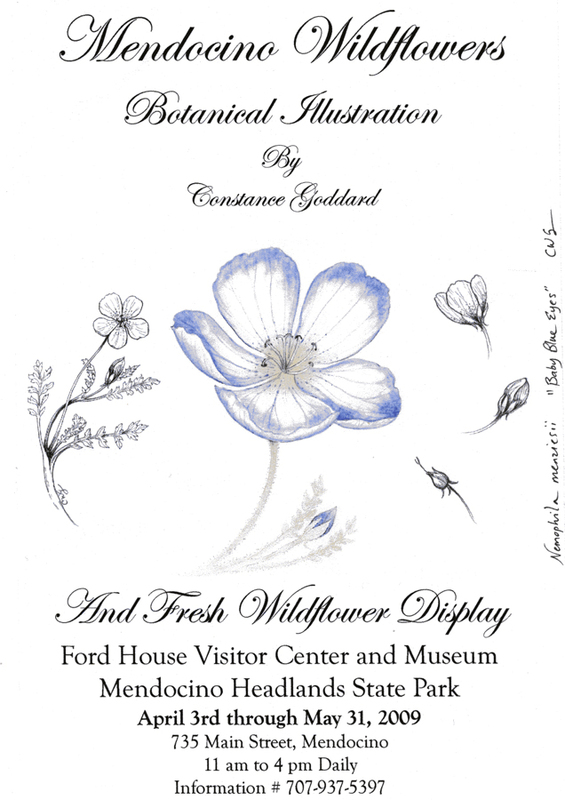 Constance Goddard: Mendocino Wildflowers Botanical IllustrationsTwo of my favorite people are starting shows of their artwork in Mendocino, so I urge you to check them out. Jim Moorehead’s photographic work will be featured as guest artist this month at the Artist’s Co-op of Mendocino (the gallery is on Main Street). There is a reception for Second Saturday on April 11, beginning at 3:30 pm and continuing until sunset. Jim is a former owner of Joshua Grindle Inn, and is currently a principal in the Mendocino County Broadband Alliance. The other show to check out features Constance Goddard, entitled “Mendocino Wildflowers Botanical Illustration”. Her show runs through May 31, 2009 at the Ford House Visitor Center, at 735 Main Street in Mendocino. The Ford House is open from 11 am to 4 pm daily; call 707-937-5397 for more info. In addition to possessing a beautiful alto voice, Connie creates beautiful botanical illustrations. I have several of her works, and the beauty and eye for detail are superb. The Ford House also has a fresh wildflower display, making it easy to identify all the different flowers out on the Headlands in the spring. The Ford House is also a venue and organizer for the 6th Annual Mendocino Coast Heritage Days, which runs the entire month of May 2009. There’s fun for the family next weekend with events springing up all along the Coast. Here are just a few special treats. Children ages 3 – 7 are invited to join us for Bunny Camp. The Easter Bunny will welcome campers for crafts and an Easter egg hunt! Campers will decorate eggs, bags and cookies and have their faces painted. Then join the dash as the Easter egg hunt begins! Two sessions: 11:00 am to 12:30 pm and 1:00 pm to 2:30 pm The camp fee is $10 per camper with a limit of 35 campers per session. This event supports the Friends of Mendocino Coast Animal Shelter. 707-937-5942 for reservations. This event will sell out, so please call early.